ALE operators are needed to help support disaster relief flights in the Caribbean area. If you can volunteer some of your spare time to put your ALE station on the air, even on a single frequency, please respond to this request. Please see the HFLINK.NET website to text chat with other ALE ops. We will be using the HFL (voice) and HFN (text/data/sounding) channel sets. The following frequencies will probably be the most active. The FCC's rewrite of its rules for the Part 95 Personal Radio Services takes effect tomorrow, September 28, 2017. * FEMA 60-Meter Interoperability Nets - 5.331 MHz (voice) & 5.346.5 MHz (digital) - FEMA IS A PRIMARY USER OF 60 METERS. AMATEURS MAY NOT CAUSE INTERFERENCE TO AND MUST ACCEPT INTERFERENCE FROM FEMA OPERATIONS. PLEASE KEEP THESE FREQUENCIES CLEAR FOR EARTHQUAKE/HURRICANE-RELATED TRAFFIC. In addition, the ARRL says W1AW has suspended bulletin transmissions and visitor operations in order to monitor the various emergency nets and provide assistance as needed. CQ MF/LF Editor John Langridge, KB5NJD/WG2XIQ, reports that the PLC (Power Line Communications) database is live and that hams may begin operating on 472 kHz (630 meters) and 137 kHz (2200 meters) as early as October 16 if they register today and receive no objection in the next 30 days. Hams may not operate on the bands without going through this process. closer than 1 kilometer from registered stations. Registration now will protect your ability to use our new MF/LF bands in the future. The following is from our friends at the Hurricane Watch Net - Net operations are suspended but monitoring continues. The Hurricane Watch Net has suspended net operation for Hurricanes Irma, José, and Katia. This does not mean were are finished with José, we are in a monitoring mode. Many people have been seriously affected by Irma, José, and Katia this week. Please keep them in your prayers as well as the first responders. I realize our net operations have disrupted normal amateur radio activity on the frequencies of 14.325 MHz and 7.268 MHz. I wish to sincerely thank the daily users of these frequencies to allow us to serve our fellow man during their time of need. Members of the Hurricane Watch Net, many who have regular working jobs, have taken time off to assist in this record breaking Hurricane Weather Emergency. The following is provided by our friends at the Hurricane Watch Net. 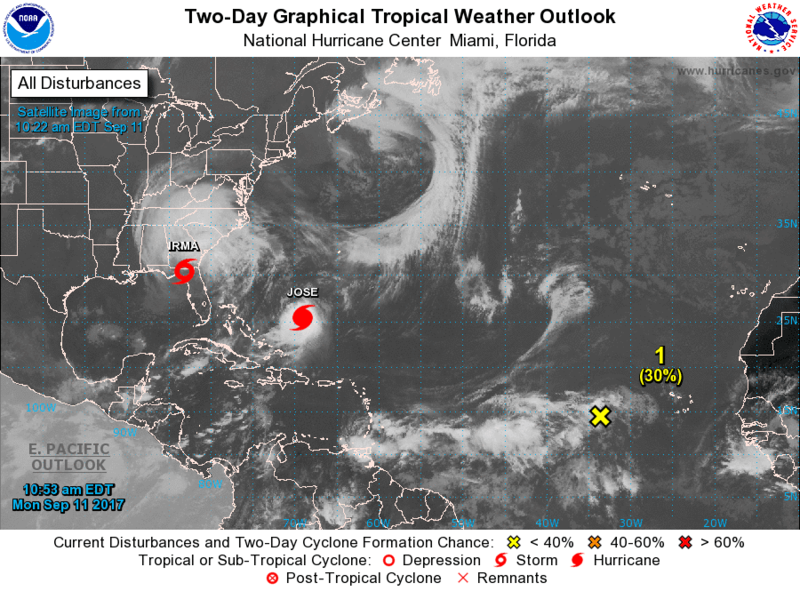 Irma was downgraded to a tropical storm at 8:00 AM EDT (1200 UTC), but remains a very dangerous storm as it continues to move northward through Florida and into Alabama, Georgia and South Carolina. Over 3 million people remain without power and that number may grow as the storm moves inland. Plus, Hurricane Jose continues to be a threat in the Caribbean and possibly even to south Florida. Considering the path of destruction caused by Irma, many areas, especially the islands, are just now beginning to get HF communications somewhat restored. In addition to collecting post-storm damage reports, we will be calling and listening for stations who have been affected by Irma with Emergency and Priority Traffic. We already know there is a huge need to for Health & Welfare and Emergency & Priority Traffic. Considering the areas hardest hit – an Andrew-like disaster spread across many islands as well as south Florida – nets like ours could be busy for days. Please, don’t drop your guard on Hurricane José. Over the next few days, this storm is expected to make a loop and perhaps affect the Turks and Caicos Islands, Bahamas, Cuba, and south Florida by the weekend. Of course, a lot can change in 36 hours, so, let’s pray the storm heads out to sea and not cause any harm to anyone! The Hurricane Watch Net remains operational on 7.268.00 MHz (LSB). We will suspended nighttime operations at 7:30 AM EDT – 1130 UTC. Daytime operations will resume on 14.325.00 MHz (USB) at 7:00 AM EDT - 1100 UTC. We will remain operational on 14.325.00 MHz (USB) until 7:00 PM EDT – 2300 UTC. We will make an announcement regarding our plans for net operations later today. To help those with Health and Welfare questions, we have a growing list of Health & Welfare Nets, Telephone Number, and more, found on our website homepage: hwn.org. We will add to this list as we get more information. I wish to sincerely thank the daily users of these 14.325.00 MHz and 7.268.00 MHz to allow us to serve our fellow man in a serious time of need. Please, continue to keep those affected by Irma in your thoughts and prayers! Hurricane Irma made landfall near Naples, FL shortly after 5:00 PM EDT – 2100 UTC as a Category 2 Hurricane with maximum sustained winds of 110 mph. The Net is currently operating on 7.268.00 MHz and will remain in operation overnight. We will suspended nighttime operations at 7:30 AM EDT – 1130 UTC. Daytime operations will resume on 14.325.00 MHz at 7:00 AM EDT - 1100 UTC, 30 minutes prior to shutting down on 7.268. Any change in Net Operation plans will be noted here, on our website, the networks of 14.300.00 MHz, and many additional amateur radio networks and media. At around 1200 PM EDT – 1600 UTC, the sun unleashed a Class X-8.3 Solar Flare. This caused a widespread communications blackout for nearly 3 hours, which could not have happened at a worse time. But, we cannot control Mother Nature, only work around her. Even with the poor band conditions, members of the Hurricane Watch Net persevered and did everything possible to help those in harm’s way. Many weather reports were received and forwarded to the forecasters at the National Hurricane Center. Additionally, we handled a few pieces of priority traffic this morning. Considering the path of destruction caused by Irma, many areas are just now beginning to get HF communications somewhat restored. In addition to collecting weather data, we will be calling and listening for stations who have been affected by Irma with Emergency and Priority Traffic. Additionally, we are available to provide backup communications to official agencies such as Emergency Operations Centers and Red Cross officials in all areas affected by Irma. To help those with Health and Welfare questions, we have a growing list of Health & Welfare Nets, Telephone Number, and more, found on our website homepage: hwn.org. The Hurricane Watch Net remains at Alert Level 5 – Catastrophic Response Mode. The Net is operating on both 14.325.00 MHz and 7.268.00 MHz. Around 8:40 AM EDT – 1240 UTC, we received a report from the island of Tortola (British Virgin Islands) of massive wide-spread damage. This is an extremely dangerous hurricane and we greatly appreciate everyone allowing us a clear frequency. It not only helps our Net Control Stations but, and more importantly, those who are affected area in need of help. Throughout our Net activation, members of the Hurricane Watch Net will be disseminating weather advisories as well as handling Emergency and Priority Traffic from ALL areas affected by Irma. We will remain operational on 14.325.00 MHz (USB) until 7:00 PM EDT – 2300 UTC or for as long as propagation allows. We will begin our nighttime frequency of 7.268.00 MHz (LSB) and continue operations overnight. As a reminder, our Net will remain in continuous operation until further notice. Note: Operations on 7.268.00 MHz will pause at 7:30 AM ET, and, if required, resume at approximately 8:30 AM ET. This will allow the Waterway Net to conducts their daily net. HWN requests observed ground-truth data from those in the affected area (Wind Speed, Wind Gust, Wind Direction, Barometric Pressure – if available, Rainfall, Damage, and Storm Surge). Measured weather data is always appreciated but estimated data is accepted. We will also be interested to collect and report significant damage assessment data back to FEMA officials stationed in the National Hurricane Center. In addition to collecting weather data for the forecasters at the National Hurricane Centers and reading the latest advisories, bulletins, and updates, we will be making for calls for those with Emergency or Priority traffic. Many areas have been severely affected by Irma and are just now beginning to get HF communications somewhat restored. Additionally, we are available to provide backup communications to official agencies such as Emergency Operations Centers and Red Cross officials in all areas affected by Irma. I wish to sincerely thank the daily users of 14.325.00 and 7.268.00 MHz to allow us to serve our fellow man in a serious time of need. We do pray this storm is over soon as we, members of the Hurricane Watch Net - many who have regular working jobs - have taken time off to assist in this Hurricane Weather Emergency. Please bear with us as we continue to help those affected and yet to be affected. We will return these frequencies to normal amateur radio use as soon as this Weather Emergency has passed.